In March, the Berkeley economist Emmanuel Saez shocked a lot of people by calculating that during the first year of the recovery from the 2007-2009 recession, incomes for the top one percent grew by 11.6 percent while incomes for the bottom 99 percent grew a mere 0.2 percent. (All figures here are in “real dollars,” i.e., they discount for inflation.) Granted, the one percent had taken it on the chin during the recession; from 2007 to 2009, incomes had fallen twice as fast for the one percent (36.3 percent) as for the average family (17.4 percent). The rich always lose big in recessions, because so much of their income comes from capital gains. (Indeed, the one percent took an even bigger share of the nation's income losses between 2000 and 2002, which included the “tech bubble” recession of 2001.) But Saez’s calculations showed that the one percent had come roaring back. In 2010, fully 93 percent of the recovery ended up in the pockets of the one percent. One year later, the bottom 99 percent were marching in the streets. When I wrote about Saez’s findings in March, I said things had likely gotten better for the 99 percent in 2011, because unemployment was inching downward. And maybe they did. But they sure didn't get better for the average American household. Indeed, some very disturbing new data from Sentier Research, a private firm, by two former high-ranking Census statisticians, indicate that median household income has fallen significantly more during the recovery (4.8 percent) than it did during the recession (2.6 percent). Only at the end of 2011 and during 2012 did median household income start to creep up again, and it hasn't crept very far. Going back all the way to 2000, Sentier found that median household income has fallen by 8.1 percent. During these dozen years labor productivity—output per worker per hour—has increased by 2.4 percent, on average, per year. The more valuable American workers become to their bosses, the more income they lose. 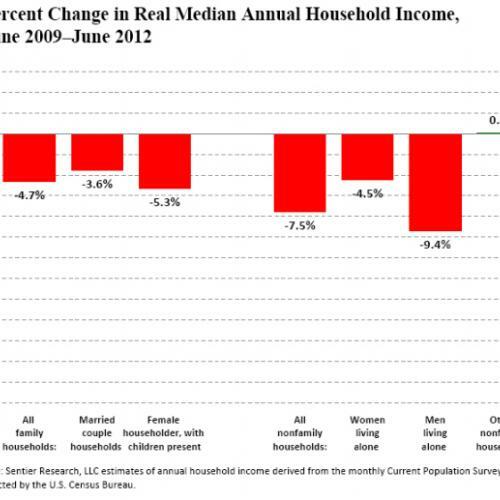 Median household income losses between June 2009 and June 2012 occurred for nearly every conceivable demographic group. Family households lost 4.7 percent. Nonfamily households (i.e., people who live alone) lost 7.5 percent. Men who live alone did very badly; they lost 9.4 percent. 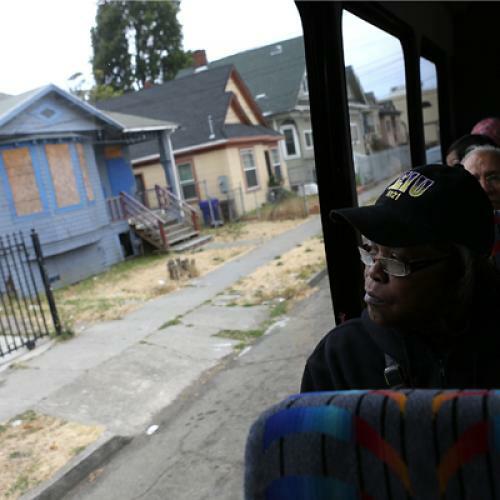 Households headed by African-Americans did even worse; they lost 11.1 percent. Married-couple households weathered the, um, recovery better than others, but still lost 3.6 percent. Weirdly, two-earner households lost more income (5.9 percent) than one-earner households (4 percent), perhaps because they started out with more income to lose. Households headed by full-time workers lost 5.1 percent. Households headed by private-sector workers lost 4.5 percent, while households headed by government workers lost 3.5 percent. Income losses occurred at all levels of educational attainment. The steepest losses were for those with “some college, no degree”; they lost 9.3 percent, followed by people with associate’s degrees (8.6 percent), high school grads (6.9 percent), people with bachelor’s degrees or more (5.9 percent), and high school dropouts (5.3 percent). High school dropouts lost the least because they never had much to lose. I’ve previously noted that a lot more wealth was lost during the recession in Republican regions than in Democratic ones. In that sense, it was a “Republican recession.” This pattern didn’t really continue during the recovery. To be sure, from June 2009 to June 2012 the biggest income losses were in the Republican West (8.5 percent) and the smallest income losses were in the Democratic Midwest (1.1 percent). But income losses were equally bad in the Republican South (4.9 percent) and in the Democratic Northeast (4.9 percent)—two regions that would seem to have absolutely nothing else in common. On a non-regional basis, households in the aggregated red (Republican) states lost slightly less income (5 percent) than in the aggregated blue (Democratic) states (5.2 percent). Since that’s basically a tie, I think we have to conclude that the Republican recession was followed by a bipartisan crap recovery. Swing states, interestingly, did worst of all; households there lost 5.7 percent in income. Maybe things will even up when Obama and Romney spend a king's ransom there this fall. All told, this is a stunningly bad economic record for an incumbent president to run on. The fact that Obama’s still the favorite testifies to how uniquely terrible the Romney-Ryan ticket is, and perhaps also to how much blame extremist congressional Republicans deserve for consistently blocking nearly every plausible avenue to economic recovery. Still, there’s no avoiding the fact that the economy has worsened over four years for the typical American household, even as it has improved for the one percent. Thank goodness Mitt Romney is about the last person on earth who would ever want to point that discrepancy out.